I was reading about a hot air balloon accident that happened a few days ago and it got me to thinking about the safety of many of the excursions and other tourist (and non-tourist) activities in the Dominican Republic. This particular incident was with a Hot air balloon company in Higuey called DomBall. Apparently they had a “rough” landing and had to come down in a sugar cane field. None of the 12 passengers were hurt and in the end “all is well”. But this got me to thinking of the many other potentially life threatening activities available here and the general regard for safety concerns I normally see here. Let’s start with a joke. In this joke it was mentioned “I’m not saying I want to kill all stupid people, I’m just suggesting that you remove all the safety labels from common items (i.e. ‘CAREFUL the coffee in this cup is very hot!’) and let nature run its course.” This kind of illustrates what seems to be a general attitude in this country. The Dominican Republic is one of the favorite locations for Eco-Tourists. People flock to the mountains of Jarabacoa for outdoor activities, and the beaches of Samana for Humpback Whale watching. While jarabacoa is great any time of year there is a distinct season for Whale Watching and that begins in January. During the winter month the humpback whales begin their migration from the cold Northern feeding grounds of the Gulf of Maine and the east coast of Canada down to the warm waters of the Caribbean for their mating season. By mid winter, January the whales arrive and remain in the Caribbean through the early spring months. Mating season lasts from January to March and large numbers of Humpback whales can be seen in the waters near Samana of the Dominican Republic. Whether you are visiting the DR on a vacation or you are on an extended Staycation it’s nice to head out on excursions! You can find almost anything in the DR to entertain the family. Some of the most popular are Whale Watching Excursions, Jeep Safari Excursions, City Tours, big game fishing, catamarans, Horseback riding into the mountains or on a beach, even Zip lining. 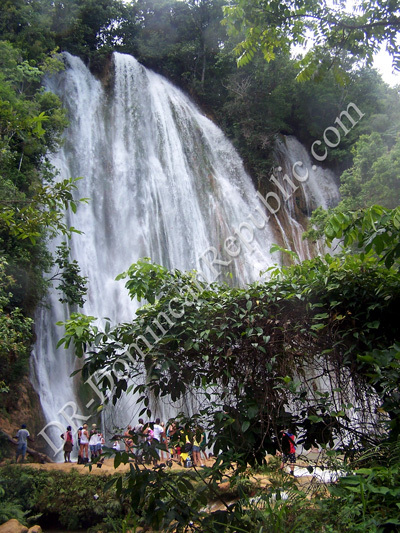 We recently took a horseback riding excursion to the La Limon Waterfalls. We had our own transportation to get us to the starting point for the excursion, but if you are staying in Las Terrenas most of the tours include travel from Las Terrenas to the trail head. Once at the trail head you are given a helmet if you like and then helped on to your horse. The saddles are well padded, which is nice for those of us that aren’t too used to riding. Also, in most cases you will be given your own personal guide that will steady and guide your horse as needed or will just act as your personal tour guide if you like. If you go during mango season they will generally hunt down some mangos for you. These are all done on a volunteer basis and are not paid by the tour operator. They make all their money off the tips they are given. Some people tip as high as 1000 pesos but the majority tips between 200 and 500 pesos. Your guide will be with you for the whole trip and pretty much takes out his whole day in the hope to make a little money so it is nice to be generous here. The horses are gentle and easy to ride. If the guide feels you are not secure with the horse he will keep it slow and steady, if you seem a little more secure he’s likely to put the horse into a trot or run a couple times to give you a little more of a ride.